This may not be the most attractive piece of knitting and you probably won’t want to use it as part of a garment but it does show various shadow`effects that can be created. 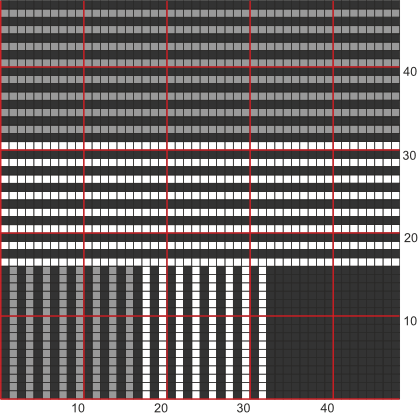 It does not show all possible permutations. 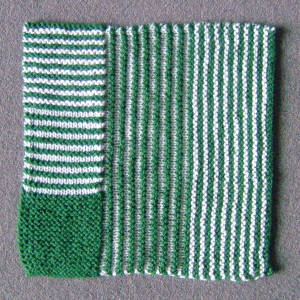 The sampler is shown from the bottom and side because the stripes are knitted in different directions. They look different depending on which side you view from. In addition to the stripes shown you could also have a solid grey area and a two-colour section where grey is the perceived colour. Using Dark cast on 16 stitches. This counts as the first row of the first ridge. Ridge 1 - Second Row : Knit. 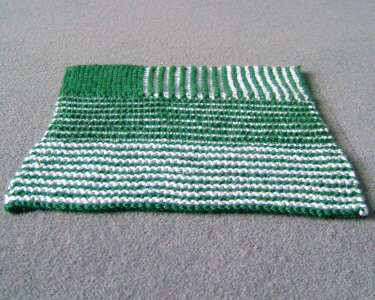 Ridges 2 - 16 : Knit both rows. Ridge 17 (Light) : Knit the first row. On the second row knit the coloured stitches and purl the white stitches. Ridge 18 (Dark) : Knit the first row. On the second row knit the coloured stitches and purl the white stitches. Ridges 19 - 32 : Repeat Ridges 17 and 18 seven more times. Ridge 33 (Light) : Knit the first row. On the second row knit the coloured stitches and purl the white stitches. Ridge 34 (Dark) : Knit the first row. On the second row knit the coloured stitches and purl the white stitches. Ridges 35 - 48 : Repeat Ridges 33 and 34 seven more times, casting off on the last row. Ridge 17 - Second row : Purl. Ridge 18 (Dark) : Knit both rows. Ridge 19 (Light) : Knit the first row and purl the second. Ridge 20 (Dark) : Knit both rows. Ridges 21 - 32 : Repeat Ridges 19 and 20 six times. 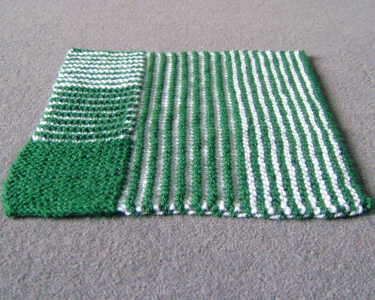 Ridge 33 (Light) : Knit both rows. Ridge 34 (Dark : Knit both rows. Ridges 35 - 48 : Repeat Ridges 33 and 34 seven times, casting off on the last row.